TRS has five tones and a rich variety of tone contours. In this article, tones are marked from 1 to 5, where 1 is the lowest tone and 5 the highest. Contrastive tone is generally found in the final syllable with some exceptions that are listed below. In TRS, the default or unmarked tone is /3/ which is usually not indicated in nonfinal syllables unless it is found to be phonemically contrastive in minimal pair comparisons, for example, [ʒi4luː3] ‘knife’; [ʒi3luː3] ‘cat’; [ʒi3luː53] ‘worm’. Final syllables in TRS may end in a single level tone: /4/, /3/, /2/, and /1/, for example, [naː4] ‘long ago’; [asi2h] ‘for’ and [ʒi4ʔ] ‘elder’ and are written with one final vowel. Tone /5/ occurs only in glides, for example /53/, /35/, /45/ as in /dukwãː53/ ‘line’, /ʒukwaː35/ ‘snake’, /joː35/ ‘quick’ and /a͡ʧiː45/ ‘ask’ and are usually written with only one final vowel with some exceptions, for example, kúu [kuː53] ‘bone’. Contour tones are restricted to final syllables. TRS words may end in two-tone sequences (i.e., contour tones), such as [ruwaː43] ‘inside’; [ane32h] ‘sell’; [ut̪a31ʔ si3h] ‘he fights’. Three-tone sequences occur only in monosyllabic words that end in a vowel and are transcribed using multiple digits, for example, [wːeː353] ‘palm mat’; [nːeː323] ‘water’, [niː313] ‘last night’ and [mːĩː313] ‘bridge’. 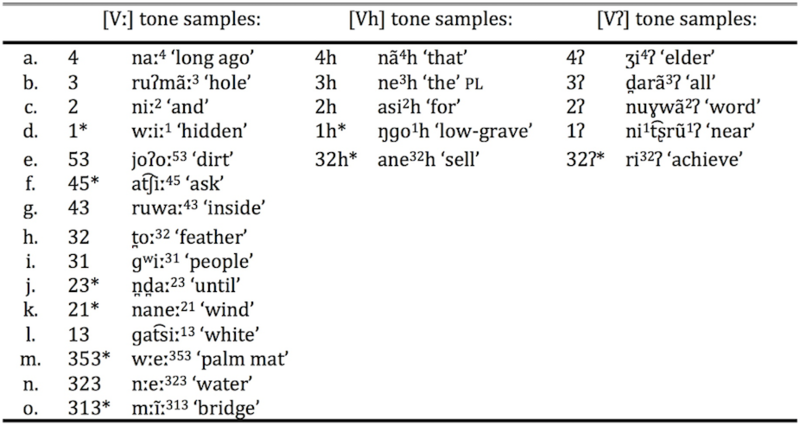 Table 4 gives examples of TRS tones and tone contours in words with three different word final rimes: [Vː], [Vh] and [Vʔ]. In TRS, tone and rime are different, although they interact. At the phonological level, the inventory of possible tones is constrained by whether and where the tone-bearing syllable involves laryngeals, for example, syllables ending in a glottal stop /ʔ/ or /h/ show fewer tonal possibilities than those that end in a vowel. Based on the examples listed below, TRS has a total of 15 tone contrasts with a possibility of 25 different word-final tone and rime combinations. The text contains all but nine of the examples listed below. Those that do not appear in the text are marked with an asterisk.